Yes, you read that correctly inbound marketing friend. Roku, the video streaming device provider, recently reached the milestone of shipping 5 million units in the U.S. In celebration of this, they released a new Roku 3 player and, more importantly for us inbound marketing nerds, a very nice piece of advanced content in the form of an infographic. 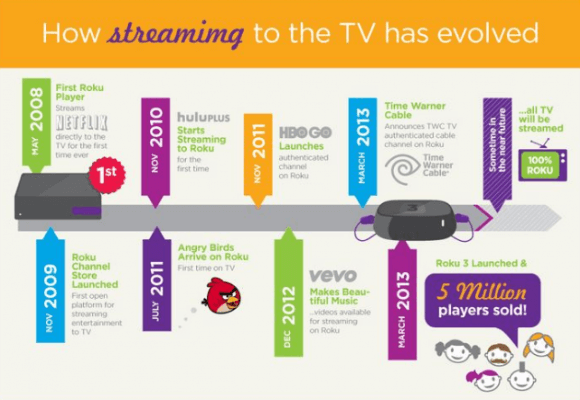 History - Roku uses its infographic to share it's company history and evolution by highlighting the partnerships it has built since the first Roku player launched in 2008. Roku does an excellent job of using visual advanced content to share their company story and celebrate a milestone. How can your company use an infographic to build its brand and commemorate a special occassion? An accounting firm might identify the amount of tax returns filed and dollars and time saved for its customers. A home builder might show total square feet built and hours that builders and craftmen have spent on custom homes since the company started. These are just two quick examples but there are many ways an infographic can be beneficial to your company.